Do you want to feel like a bird? See astonishing Caucasus from above? Experience adrenaline running through your veins? Adore the breathtaking views only flying can provide? 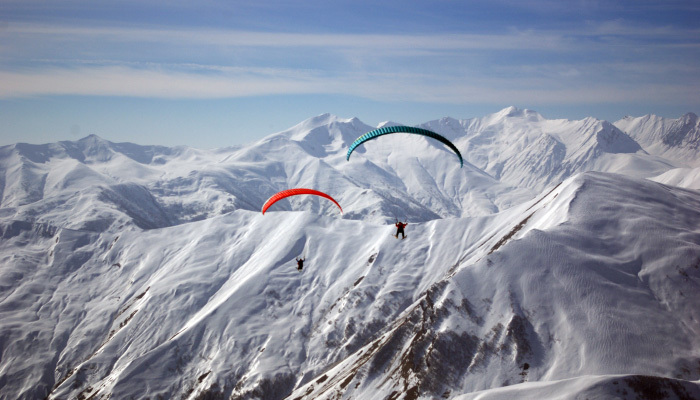 Welcome to Fly Caucasus Paragliding Company! The earlier booking - the best rate! Check it right now in online booking! We've been paragliding in Georgia since 1999. In addition to general experience in the sport, we are especially experienced in flying in local weather conditions. Thanks to this we can offer safe and enjoyable flights all year round. We are also the only local paragliding company with its own monitoring weather devices and equipment in Georgia. This allows us to choose the best and safest time for your first amazing flying experience. Looking for reliable and professional instructors to introduce you to paragliding and showing you amazing Caucasus from the sky? You're in the right place! 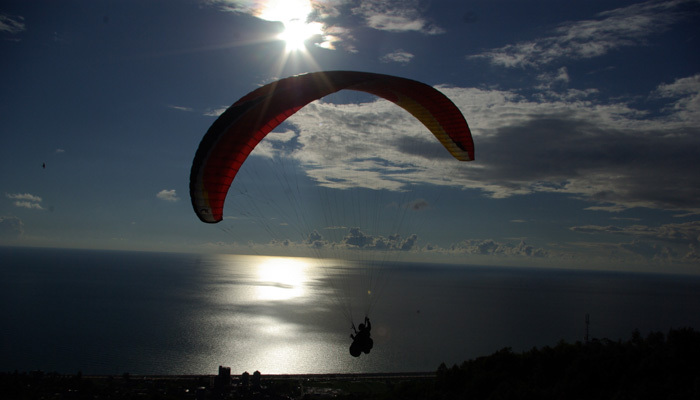 Fly Caucasus Paragliding Company offers the best tandem paragliding experiences in the region. We fly Gudauri and Tbilisi every day all year round. You can choose a flight from 15 minutes to as long and far as possible. 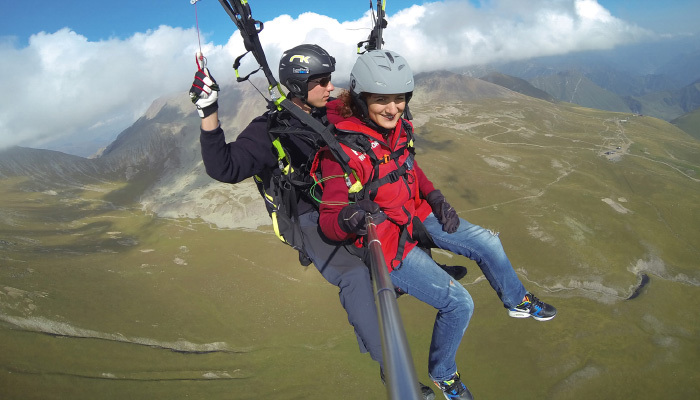 From smooth and easy flying experience to something extreme, like flying from the highest point in Georgia. Our paragliding offers suit everyone: the young and the older, men and women, or even children (from certain age or body weight). What is for sure, it will be amazing, safe and unforgettable! 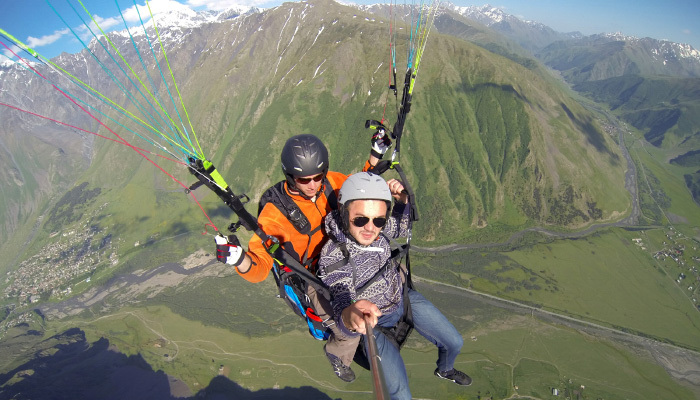 We have proven safety record from the day one of Fly Caucasus Paragliding Company. We credit this achievement to our highly experienced and professional team, and high quality, well maintained and certified equipment we use. Our certified professional pilots, all with 10-15 and more years experience in the sport, fly up to five times daily all year round. They strictly adhere to company's safety rules and procedures. Before a flight, every passenger is briefed and equipped with helmet and flying suit. All pilots have complete reserve and communication systems. Weather conditions are carefully assessed before we take you up. You are assisted by our crew on both taking off and landing. Come and enjoy your flight without any worrying! 100% safety guaranteed. Select a type of experience: short Discovery flight, longer Adventure or Cross Country flying for a few hours (limited locations). Choose a date and time you'd like to fly. Make online booking to save your time and money. Or come to our office to book your flight there. After arriving to your flying location you'll be introduced to your instructor. You'll be shortly briefed on how your flight is going to happen and checked to safety. Then your pilot will take you off from a mountain slope with a ram-air gliding parachute. 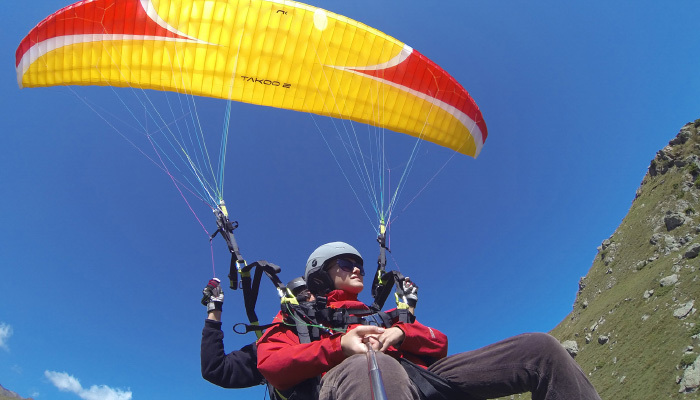 To make this happen, once the canopy is inflated overhead, you'll need to take a few steps or a short run - until the wind will catch the canopy, and you'll be airborne. In the air your instructor will fully control your flight's direction and speed, so that you could just enjoy the view. Or you can ask your pilot to let you try the controls, and feel like your canopy moves forward, up and down on the air waves. Unless it's a Cross Country flight, you'll be landed back to your take off spot. In other case, you'll be transported back to your starting point by land. Any comfortable clothes suitable for the season are ok, but be aware that it's going to be a bit cooler up in the sky than down on the land. We advise wearing pants and a jacket plus sturdy footwear, like thick shoes or winter boots (required from October till April). Book online to save your time and money! Online booking is your guarantee of a safe and unforgettable vacation in Georgia!